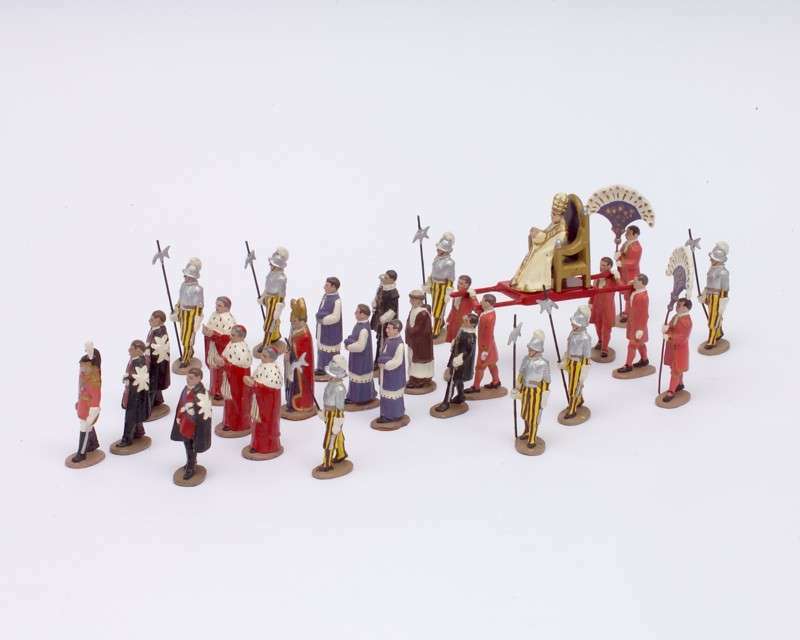 The artifact presented here is a complete, thirty-piece set of a papal procession dating from the pontificate of Pius XI who reigned from 1922-1939. The pope is seated on what is known as the sedia gestatoria, which literally means, the chair for carrying. It is a portable ceremonial throne on which popes were carried until 1978. It consists of a richly adorned, silk-covered armchair, fastened to a suppedaneum on each side of which are two gilded rings. Through these rings pass the long rods with which, traditionally, twelve footmen, the palafrenieri, in red uniforms, carry the throne on their shoulders. Even the suppedaneum had symbolic meaning as it was the support used for Christ’s feet at the Crucifixion. It has come to mean a footstool, which was the meaning for the pope while being carried aloft in the sedia. white ostrich feathers are carried at either side of the chair. They are intended as a sign of honor and as a means to keep away insects and provide relief from the heat of Roman summers when so many popes were crowned. The sedia gestatoria was mainly used to carry popes to and from papal ceremonies in the Basilicas of Saint John Lateran and Saint Peter. It was used for nearly a millennium. Many sources believe the sedia originated in the leadership of the ancient Roman Empire. The throne was used in ceremonies at the coronation of a new pope, and generally at all solemn entries of the pope to Saint Peter’s or to public consistories. Pope Benedict XVI’s tiara-less coat of arms, is “order, jurisdiction and magisterium.” Still another theory links the three tiers to the “celestial, human and terrestrial worlds,” which the pope is supposed to symbolically link. are shown in the figures as well as several bishops and cardinals in ceremonial vestments. Pope John Paul I declined to use the sedia and the papal tiara but was eventually convinced by Vatican staff to use the sedia in order to allow the crowds to see him. Blessed John Paul II refused both the sedia and the papal tiara as has Pope Benedict XVI. For the first time in over eight centuries, these three modern popes declined a coronation and opted for inauguration ceremonies instead while wearing a miter in place of the tiara. The miter is a symbol of spiritual rather than temporal authority. a great asset to the Collection.